Santa Catarina Church is located on the Rua do Loreto and provides a strategic separation between one of Lisbon’s most picturesque neighbourhoods, Bairro Alto, and the bordering area of Santa Catarina. 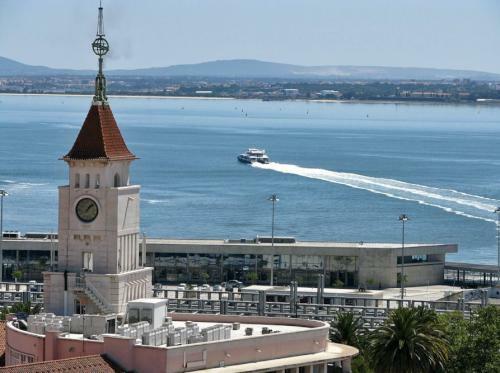 Straying into the relaxed Santa Catarina area makes for a welcome departure from the more vibrant atmosphere of the Bairro Alto, with its many bars and restaurants and thriving year-round nightlife. 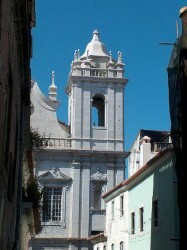 The Santa Catarina Church is surrounded by a labyrinth of streets lined with pastel-hued houses. Although it is home to a few restaurants and bars that come to life at night, the area is mostly popular as a daytime destination. Visitors come to enjoy the attractive gardens of the Santa Catarina viewpoint, from which they can admire the river views across the 25 de Abril Bridge to the opposite banks of the Tagus beyond. The church itself is a fine example of Portugal’s baroque style, blending simplistic forms with opulent and ornate decoration. 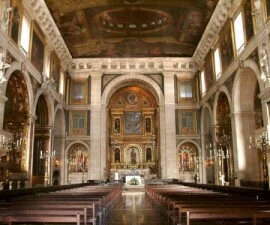 It is connected to the Convento de Sao Paulo da Serra da Ossa and became the parish church of Santa Catarina after the religious orders were banned in 1834. The civil parish of Santa Catarina was instituted in 1559 and was until recently one of the most populous areas of the city. It is a unique area that combines the aristocratic with the popular and remains an interesting mix of residential and commercial areas. Many of Portugal’s notable figures lived in the area, including Sebastiao Jose de Carvalho e Melo, Manuel Maria Barbosa du Bocage, Almeida Garrett, Alexandre Herculano, and Camilo Castelo Branco. Maria Amália Vaz de Carvalho was also born, lived, and died in the area. The church is important for its historical connections with the discoveries of the 14th and 15th centuries and makes for an interesting detour when you are explore the area around the Bairro Alto and beyond. A look inside is a must, to admire the rococo-style decorated stucco ceilings and marvel at the monumental organ of craved and gilded wood. Don’t miss the 17th-century upper choir stalls and the marble altarpiece of Senhor Jesus da Pobreza (Our Lord of Poverty). The building also houses a number of paintings by Bento Coelho da Silveira. 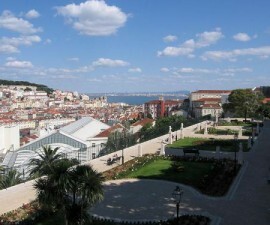 Close by the Santa Catarina Church, near the Miradouro da Santa Catarina, is Lisbon’s Museum of Pharmacy. This is also well worth a visit to wonder at the instruments, flasks and other pharmaceutical paraphernalia. The museum provides a fascinating insight into the historic evolution and technology of pharmacy in Portugal through the ages. Take a ride in the Elevador da Bica on your way up to or down from Santa Catarina (or both if you wish to save your legs). 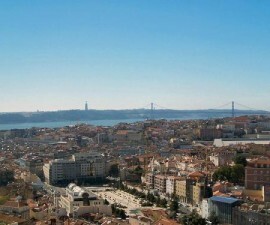 The Elevador da Bica is one of Lisbon’s key landmarks. Dating back to 1892, it was originally operated by a water counterweight, though it has since been electrified.